Do you know how to respond to statements that your material is hazardous or toxic? Are you able to quantify your firm’s environmental and social benefits and impacts? Do you proactively engage with your customers, suppliers and other stakeholders such as investors on environmental, social and governance issues? Can you ensure your sustainability data and information are accurately and efficiently managed? These questions are particularly important for the mining and metals sector’s environmental, social and governance (ESG or sustainability) efforts because it has recently seen quite a lot of turnover at CEO level – a survey by Bedford Resources of 200 companies in the sector found that “approximately 17% of CEOs, 15% of CFOs, and 8% of COOs left their respective companies last year.” In part, this reflects the current low commodity prices, but it may also reflect an unwinding of some of the mergers of the last decade – and the leaders who instigated them. Regardless of the reason for this turnover, new leaders often want, or indeed have been hired specifically, to cut costs and restructure the company. In a period of lower commodity prices, your company’s sustainability programme, like everything else, will come under scrutiny and if it cannot demonstrate the value that it creates, it will be seen simply as a cost that is ripe for cutting. This is particularly true for companies where sustainability has long been seen as a “nice-to-do” rather than a “must-do”, so it is important that the business case for sustainability is clear. If you can answer ‘Yes’ to the four questions above, then your sustainability programme should easily be able to show that it is paying its way. But if you haven’t also quantified the value to the business of your efforts, you may be missing opportunities to expand these efforts or demonstrate why they are key to your company’s strategy and its overall business success. Sustainability programmes can strengthen your business in four ways as outlined in the illustration below. It can help manage your operational and regulatory risks; cut costs by highlighting efficiency opportunities; boost revenues by identifying new markets, new material applications or new business models; and it can enhance your brand by helping you to manage your reputation and attract and retain staff. Based on our engagement with the mining community, we know that the key areas that sustainability contributes directly to broader strategic priorities are: employee attraction and retention; risk management; and growing one’s license to operate. By understanding your own corporate priorities and demonstrating sustainability’s ability to contribute to them you are better positioned to drive engagement, improved decision making and appropriate investment. Attracting and retaining top talent consistently ranks highly amongst CEO priorities, as it is a key indicator of success. Sustainability efforts contribute value here both directly – given individuals’ interests in their companies’ efforts in this area – and more broadly through reputation management. Research by the consultancy Global Tolerance shows that almost half the workforce now want to work for an organisation that has a positive impact on the world. Young people entering the workforce today want to work with organisations that align with their goals and values. This expectation expands beyond traditional environmental careers – we often hear from professionals in the mining sector that sustainability efforts are increasingly important to attract and retain top talent, regardless of roles within the organization. People at all levels don’t want to work with companies that are viewed by society as poor performers on environmental and social issues. These factors simply were not on the radar in years past but they are vitally important now. Risk is nothing new for the mining and metals industry, but it has evolved dramatically in line with the growth of the internet and especially social media. With sites like corpwatch.org, any missteps by a company are likely to be communicated rapidly and broadly and also followed for an extended period of time. Those missteps are often viewed through the lens of sustainability issues and efforts to address them. Meanwhile social media and other online channels make it much easier for workers and non-governmental organizations (NGOs) to share their concerns about issues ranging from pay to health and safety and working conditions. 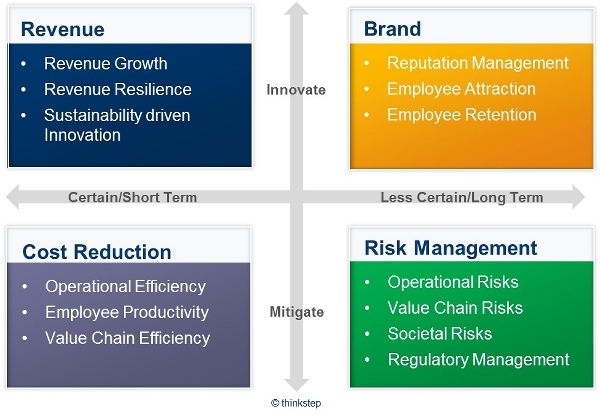 Having a strategic approach to managing these challenges is not simply a ‘nice-to-do’ activity, it is critical to the success of your business and brings real value when implemented effectively through improved risk management as well as the reputational benefits tied to employee attraction/retention. There are clearly lots of efforts to secure the industry and individual company’s licence to operate, for example ICMM’s Engaging with Society report. This is part of the work that the industry needs to do to explain the contribution it makes to society at a time when the expectations on the industry from a sustainability perspective are higher than ever before. As discussed in the third article from this series, communication on these contributions only work if the organizations making the claims are seen as credible. That credibility comes through managing the impacts of the business rather than simply communicating the benefits. Being credible on sustainability and therefore able to better engage with society on these topics is crucial. The industry’s “license to operate” is at stake and operating sustainably is the key to keeping that licence. At the same time, a focus on sustainability does not conflict with the mood of austerity that many mining and metals companies face. It can help to uncover efficiencies, reduce waste and identify new markets. But to ensure that thinking about sustainability issues is embedded in every decision that is made requires a culture change in many companies. And while it has to start at the top, the sustainability community, in every sector, has a key role to play. We need to explain to CEOs and senior managers in language that they understand that sustainability is a business issue that adds value to the company and helps to create a stronger, more resilient organization. *PE INTERNATIONAL changed its name to thinkstep in March 2015. This entry was posted in Corporate, thinkstep. Bookmark the permalink.